Today, we had some fun looking at root samples from young trees and harvest-ready trees as well and we like what we see! Every sample we looked at under the microscope has lots of little "corn dogs" growing on it. That is golden!!! You may remember that we have had our share of trouble with a disease (Eastern Filbert Blight) and it has moved into the big orchard as well. We have more than a little concern about the way it is affecting our beautiful filbert trees. It really hurts to see the trees we have worked so hard to maintain have these awful black bumps and splits in the bark. You don't have to be a scientist to know that it will affect the trees' health and, consequently, the truffle production, adversely. We have worked especially hard over the past year to prune the affected limbs and let the little "sucker" limbs grow just to keep the trees alive and it appears to be working. The goal is to keep that fungus alive and well. As we approach truffle season, remember, if you want to buy fresh truffles, sign up on our the FRESH eList, so you can be notified when we harvest our beautiful truffles. Jane and Deana posing with their kitchen hats. Deana also worked with me at the Farmers Market on Saturday. We're a pretty good team. Friday keeps asking when he can go to the market again. I'll have to get him there soon. He would have so much fun meeting the other dogs and people. He's such a social animal. 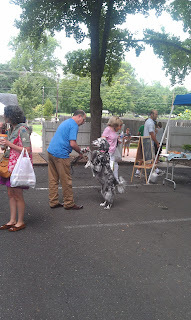 So, next time you're in the Winston-Salem area on a Saturday morning, come to the market. We always have a good time -- sampling delicious truffle products and telling the truffle story and seeing old friends and making new ones. I'd go to the market even if I weren't a vendor. One last thing before I go -- I have to share this recipe with you. Rick outdid himself and a good recipe is something that should be shared. This was an original creation and one that we will do again and again. Sprinkle the mushroom caps with soy sauce, spray with olive oil, dust with garlic/wine seasoning and cook at 350 for 12 minutes. Mix together the onion, red pepper, artichoke hearts, pesto, tomato and garlic. Fill mushroom caps and return to the oven for 4-5 minutes. Add cheese and broil until cheese melts. Top with olives, sprinkle with black truffle salt and serve. Too Good for Words!! !